The Catholic Diocese of Brownsville is accusing the federal government of violating the church’s right to freedom of religion by condemning land it owns to build border fencing. The federal government filed a Declaration of Taking on Oct. 25 to use eminent domain to take properties that include the La Lomita Chapel and property south of the Juan Diego Academy in Mission on brush land next to the levee. The public purpose of the taking is to conduct surveying, testing and investigatory work for proposed construction of roads, fencing, vehicle barriers, security lighting, cameras, sensors and related structures to secure the border, according to the government. The Department of Homeland Security waived more than two dozen laws on Oct. 10 to pave the way for construction of border fencing through Hidalgo County that cuts through wildlife refuges and church property, as well as to build gates and related infrastructure in existing border fencing in Cameron County. On Nov. 6, the Catholic Diocese of Brownsville asked a federal judge in McAllen to grant a temporary restraining order against the government’s plans to take the church’s land, arguing that the taking violates its right to exercise its freedom to practice religion as well as alleging that the DHS waiver exceeded the authority authorized by Congress. The government’s planned taking could spell doom for the historic La Lomita Chapel and U.S. Customs and Border Protection officials during a November Q&A webinar with local stakeholders would not rule out impacts on the chapel. 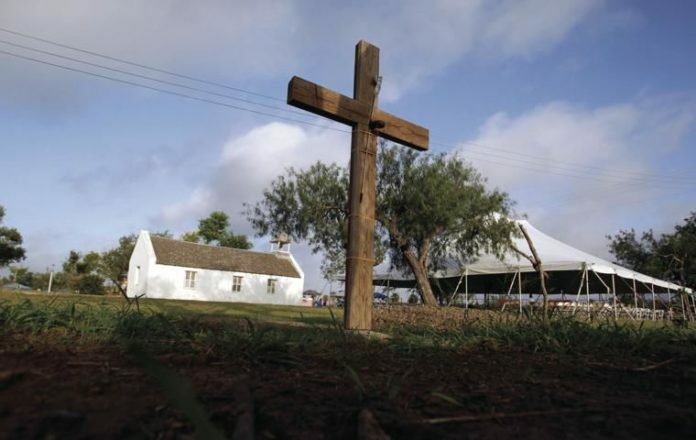 The church further alleges that the government did not take religious services and activities that occur at the chapel into consideration when planning border fencing. “Answering further, Defendant would show that La Lomita Chapel is a sacred building destined for divine worship, especially, its public exercise,” the church said in its filing. The Diocese also argues that the government’s initial offer of compensation of $100, pending further negotiations, in unjust. The Diocese has demanded a jury trial to determine just compensation, court records show.